The junk files make your phone run slowly, less storage space for your photos and music and worst of all there will be limited space for you to install important apps. For now, there may be enough free space for everything, but eventually you will be required to organize your Android phone and get rid of all the junk files that serve little or no purpose in your phone. So to ensure the smooth running of the device, you need to clear junk files on Android phone. For iPhone users, please read the page of clearing iPhone junk files with 1 simple click. The whole task of deleting junk files from the phone is simple and straightforward - but only once you know what you are doing. You could either do it manually or use a tool like AVG Cleaner. Here, we briefly outline how to go about either method. Part 3. How to Clear Junk Files on Android by Using AVG Cleaner? Tip: What If You Wrongly Delete Some Important Files During the Clearing Process? Speaking of deleting junk files, many users would think of removing useless apps or unwanted files at first time. This would be a feasible way but must not the effective one- you need to find out the unwanted file or app from the menu and then remove them one by one. This would be time-consuming and inefficient and you have other choices actually. In this case, to remove the junk files more effortlessly or effectively, you can choose to clean the junk files once rather than delete the file one by one. It is not a hard task at all- you can go to Settings App in your phone to clear cached data or factory reset the device. Cached data is also a kind of junk files which also takes up a lot of storage space of your phone. Therefore, you can select to delete the caches of all applications on your phone to release the phone space. You can complete it with simple clicks. Now just go with the steps below to clean the app caches on your Android phone. - Go to Settings app on your phone and then click on the option Storage. - After that, you will see a list of options on the interface. Here you need to elect the option Cache Data or Saved Data. - Then a screen will appear to ask for confirmation to remove everything stored within the caches. Just confirm it to begin the removing process. This means will help to erase all the app caches on your phone. However, cached data is just a part of junk files and if you want to get rid of the useless files more completely, you may need to factory reset your phone. Factory reset would be the most powerful way to clean Android junk files. By using this way, you are not only able to wipe all the files on your phone but also can erase all the phone settings. After accomplishing the process, your phone will run as a new device. But meanwhile, you will lose all the data and settings so you need to backup the wanted files in advance. After backing up your desired data, you can start the resetting process now. The followings are the detailed steps for your reference. - Enter the Settings App on your Android phone. - In this section, you should tap on the option Backup and Reset and then continue to choose Factory Data Reset. - Next, you can go on to tap on Reset phone option. After that, you may have to type in your PIN again. - Then you need to click on Erase Everything to begin the erasing process. - Once the process ends, you can restart your phone and then set it up. The methods we mentioned above doubtlessly can help you to delete some junk files on Android phone but both of them are not thorough and quick enough. Then is there any way to clean junk files on Android more quickly and completely? The answer is Yes! But to achieve this goal, you need to use a professional Android data cleaner as your assistant. If you want to clear junk files on your Android phone more quickly and thoroughly, you can turn to this all-in-one cleanup tool - MobiKin Eraser for Android. Not only can it allow you to clear junk files on Android phone in one click, but also you can clean temp files, log files, etc. In addition, it supports almost all kinds of Android models like Samsung, LG, HTC, Huawei, etc. Now you can follow the instructions below to start clearing junk files on Android phone to have a try. First of all, please be sure the software is downloaded and installed on your computer or laptop, and then you can launch it directly. After your Android device has been detected by the software, you can choose the cleaning mode as you like. To complete that, you can click "Medium" select Low Level, Medium Level or High Level in the pop-up window as you like. After that, you can click "OK" to confirm your option. 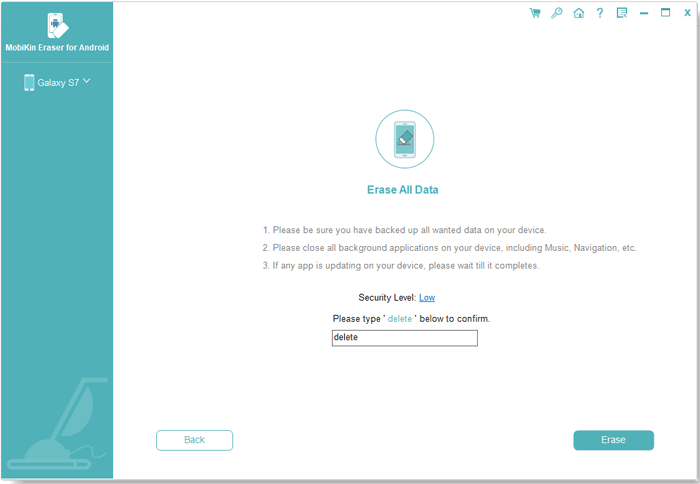 Note: For Android devices, the software now only supports the Erase All Data mode, so it is strongly recommended to make a backup of your important data on Android device in case of unexpected data lost. And the software will be improved with more functions for Android soon. Finally, just type "delete" and hit "Erase" on the "Erase All Data" interface and then all the junk files on Android will be cleared from your Android phone immediately. How to Clear Junk Files on Android Phone Using AVG Cleaner? Go to the Google Play Store and look for AVG Cleaner. Download, install and fire it up. You will be presented with easy options of clearing junk from the phone. Use the steps outlined below. 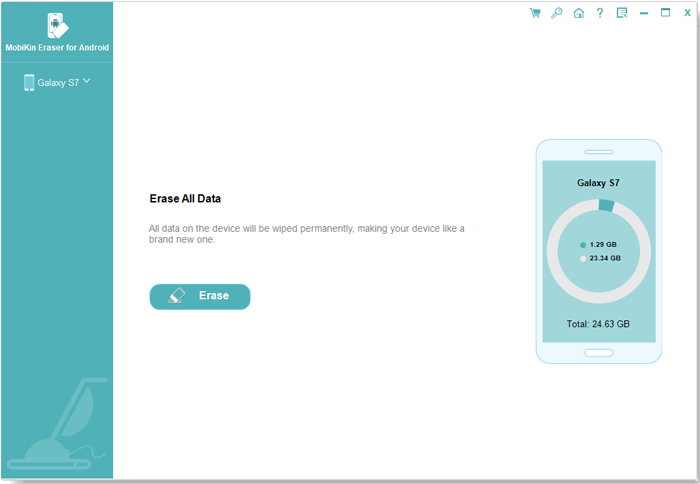 Just as the name suggests this method cleans all the cache data on your Android phone. This cache mechanism has the limitation of allowing quick buildup of useless files on your device. The solution therefore to run this process frequently. This is an effective method of getting rid of all your call record and messages threads. However little space your call logs and message take in your Android phone, they still need to be removed frequently in order to increase the search speed of your phone. This method is removing all the residue contents left behind by your SD card after you have uninstalled it from your device. The method is meant for cleaning up your browser history, Google maps, Google markets, and search records of Gmail and clipboard records for the sole purpose of protecting your privacy. With this kind of method, you can individual select the items you wish to do away with. What If You Wrongly Delete Some Important Files During the Clearing Process? It is common that users would wrongly delete something important while removing junk files on their devices. 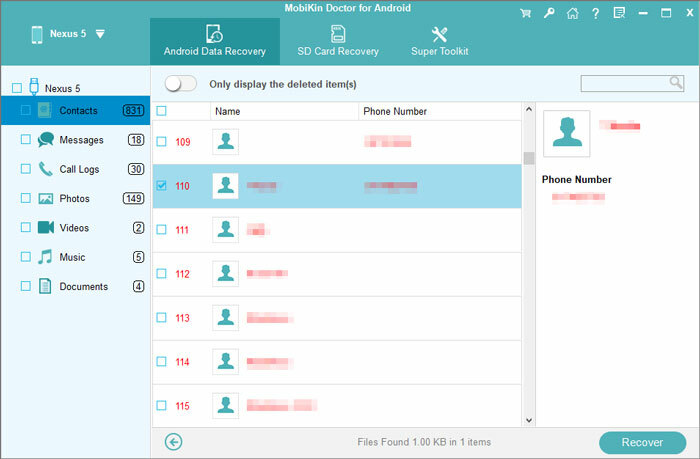 But don't be nervous if you make a mistaken deletion since the lost data can be easily recovered with the tool- MobiKin Doctor for Android (Win & Mac). 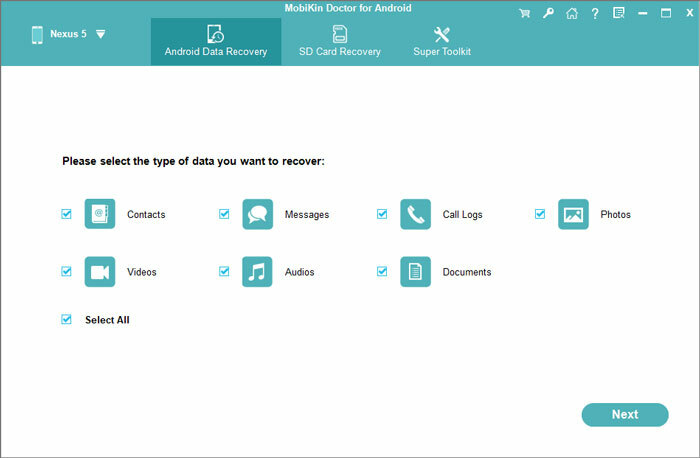 With it, you can recover more than 7 kinds of file on Android, including contacts, messages, music, images, videos and so on. No matter the files are lost due to wrong deletion, factory reset or root, it can help you to retrieve them with simple clicks. You can download its free trial to have a try. Use a USB cable to connect your phone to computer and then launch the suggested software on PC. After the connection, you need to enable USB debugging on your phone so that it can be detected. Here, if you want to recover contacts, messages or call logs, you need to root your phone as well. 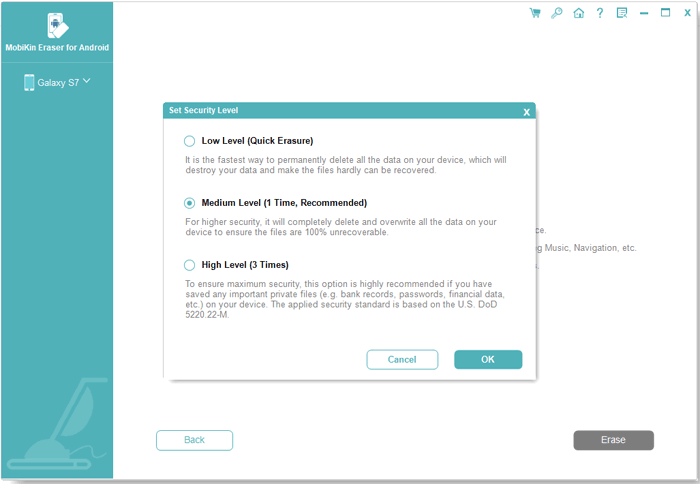 Once the program detects your phone, the files saved on the device will be listed on the main interface. Here you can tap on the wanted folder in the left panel to locate its contents and then preview the data. Finally, you should tick the files that you want to restore and click Recover to get back your desired files. These are all the methods that we would like to suggest you to clear junk files on Android phone. You can select one of them to remove the unwanted files from the device easily. But in case of data loss, you'd better backup the important data on your phone beforehand or you may permanently lose them. After deleting these useless files, you will be able to better enjoy your phone. Hence, don't hesitate to have a try! If you have any problem about the methods above or have other better ways to remove the Android junk files, please share with us!